linked to Crohn's disease and multiple sclerosis. Institute scientists have shed new light on how this immune response is controlled, and hope it could lead to new drugs for people with these chronic diseases. Crohn’s disease and multiple sclerosis are linked to defects in the NOD2 immune pathway that enables uncontrolled inflammation. Scientists identified key regulators that are essential for controlling the inflammatory response in these conditions. The discovery will assist researchers in identifying new, targeted treatments for inflammatory diseases such as Crohn’s disease and multiple sclerosis. 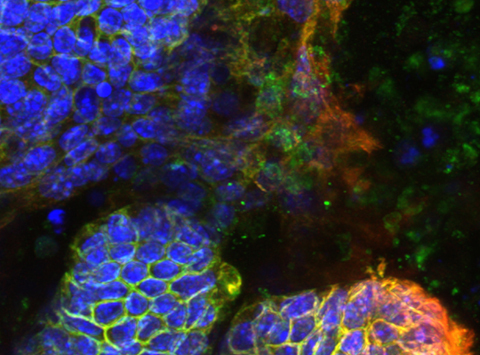 Mr Che Stafford, Dr Ueli Nachbur, Professor John Silke and colleagues at the Institute led the research, which was published today in Cell Reports. The critical immune pathway in question is the NOD2 pathway, which detects and responds to bacterial invaders by releasing inflammatory signals to fight the infection. Inflammatory diseases such as multiple sclerosis, Crohn’s disease (an inflammatory bowel disease) and inflammatory skin diseases have been linked to faults in how the NOD2 pathway is regulated. Dr Nachbur said faults in how the NOD2 pathway was controlled could enable the cell to continue to cause inflammation long after the bacterial threat has passed, leading to chronic inflammatory diseases. Mr Stafford said the research team showed that a protein called xIAP was the ‘master controller’ that initiated inflammation via the NOD2 pathway. “Targeting key components of the NOD2 pathway shows promise as a way of switching off ongoing inflammation associated with diseases such as Crohn’s disease and multiple sclerosis. “In 2015 our research team showed that blocking a different protein in the NOD2 pathway could halt inflammation, and was able to halt the progression of multiple sclerosis in a preclinical model. So it is very exciting to identify other potential targets for treating these diseases,” he said. “Chronic inflammatory conditions such as Crohn’s disease and multiple sclerosis have a very significant impact to people’s lives and new, targeted treatments are urgently needed. “xIAP has other roles in the cell, such as regulation of cell death, so it is a tricky target for treating inflammatory diseases. However these new discoveries provide us with vital information to develop new treatment strategies that could lead to a safe and effective way of switching off inflammation for treating disease,” Dr Nachbur said. Mr Stafford is a former PhD student at the Institute, enrolled through the University of Melbourne’s Department of Medical Biology. The research was supported by the Australian National Health and Medical Research Council, Australian Research Council, Swiss National Science Foundation and Victorian Government. Our researchers are aiming to decipher how multiple sclerosis occurs, with a view to discovering new treatments.